He is living proof that some rabbis have a vision and can actually see the truth. It is high time for the ADL and other Jewish establishment institutions to accept the multiplicity of voices that seek to respond to tragic reality of Israel/Palestine. Vilifying other Jewish organizations as “hate groups” does nothing to further this critical debate. Throughout centuries of Jewish history, there has been a rich and wide-ranging debate over what constitutes Jewish values and how we might live them out as Jews. Talmudic tradition repeatedly makes it clear that this debate is in fact, a sacrosanct cornerstone of our spiritual heritage. Jewish Voice for Peace is proud to be part of this Jewish marketplace of ideas. We believe our vision has important and critical role to play in the Jewish communal debate over Israel/Palestine. But we have no illusions that all Jewish institutions will accept our alternate views. We are certainly open to hearing differing points of view; indeed, we would welcome such a conversation as a machloket l’shem shamayim — a debate for the sake of heaven. Sadly, in the Jewish communal world sacred debate too often devolves into denigration and political name-calling. The latest example: the Anti-Defamation League’s recently released report that publicly puts JVP on the same level as hate groups such as the Aryan Nations and the Montana State Militia. This kind of attack on JVP is all the more saddening because the ADL does important work in the community, particularly in the realm of civil rights and multi-cultural education. However, like too many other Jewish establishment institutions, the ADL has become increasingly obsessed with supporting Israel at all costs — and publicly vilifying those with whom they disagree. These poisonous attempts to marginalize progressive voices in the Jewish community must stop. For far too long, the ADL and other self-appointed Jewish gatekeeper organizations have sent out the message that participation in Jewish life must depend upon unquestioning support for the state of Israel and its policies. Those who seek to hold Israel to account for its oppressive policies toward Palestinians are routinely marginalized as “anti-Israel” — an incendiary epithet that the ADL dangerously conflates with anti-Semitism. The ADL fails to consider whether or not Israel’s brutal military occupation of Palestinian land, its policies of home demolition, forced expulsions and land expropriation might be counter to Jewish values. These issues, of course, have been the “elephant in the room” of the Jewish community for decades. As a Jewish organization, we believe it is simply not the Jewish way to stand idly by in the name of communal uniformity. We believe that this Jewish vision is resonating with increasing numbers of American Jews, particularly of the younger generation, who have previously felt themselves kept at bay from Jewish communal affiliation. This alienation has been caused in no small measure by tactics of Jewish establishment institutions such as the ADL, who have long been promoting a fear-based, lock-step approach to the issue of Israel/Palestine. Growing numbers of American Jews want a positive, progressive American Judaism rooted in justice, dignity and equality for all, including the Palestinians. Speaking hard truths to power is a venerable Jewish tradition that dates back to the prophets. While we realize this kind of criticism is painful for some in our community to hear, voicing these kinds of concerns has long been considered a Jewish religious imperative. We certainly don’t expect every Jewish individual or organization to be comfortable with our message. But we do reject the incendiary assertion that we are “exploiting” Jewish tradition when we speak and act according to our Jewish conscience. 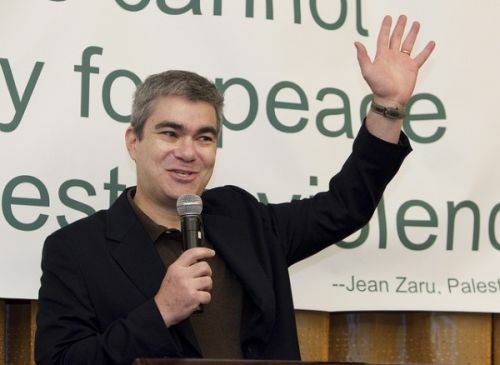 *Brant Rosen is the Co-Chairperson of the Jewish Voice for Peace Rabbinical Council.